Modern landfills are much more than your common dump. They’re massive systems that are engineered to contain garbage, create usable fuel, and even create usable recreational spaces. They blend in among large communities and are a part of most states around the country. You might even live near a few of these modern marvels without realizing it. There are many misconceptions about landfills, and we’ll go over how they work, what happens within a landfill and how all that garbage is contained safely. There’s a lot of work that goes into making a modern landfill operate properly, which is why they are relatively safe to be around, and not the big smelly messes that they once were. What is a modern landfill? A modern landfill is an advanced garbage holding facility that’s designed to keep refuse from contaminating surrounding areas, while harnessing the power of the methane gas that’s produced from all the trash contained within. 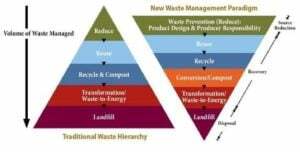 A modern landfill is a multi-layered system that handles a variety of challenges that come along with storing sometimes highly volatile trash. They are large holes in the ground with thick liners at the bottom. There’s a drainage pipe designed to handle any liquid that forms at the bottom, there are a series of pipes at the top that collect and direct any accumulating methane gas in the system, and there is an advanced top or cap to the system designed to keep the trash and its associated smells contained, while preventing liquid from seeping down in. Things have changed a lot since original dumps and landfills were being used. Today, most of the active landfills are highly complex systems designed to keep from contaminating the surrounding environment while helping us to get rid of all the garbage that’s being produced. Old landfills didn’t face any real regulation and often were hazardous locations and an actual danger to the environment. New landfills face very strict regulations and must follow a long list of rules in order to protect the environment. Leachate is a nasty chemical liquid that’s formed as water flows over garbage. Old dumps allowed this liquid to flow out into the ground and to contaminate ground water. Modern landfills are equipped with thick liners that contain this liquid, so that it can be pumped out and treated. Dumps, or early landfills are known for smelling terrible and being infested with rodents. That’s because these sites are uncovered and all the decomposing garbage is just out in the open. These sites don’t exist very much any longer, and modern landfills are covered with a thick cap that prevents any strong smells. Even active landfills generally don’t smell bad, because the garbage is piled up with inert materials daily to limit smells. After open dumps stopped being used, early landfills were put into place. They locked in leachate using thin plastic liners, but vented methane right out into the open air. Many such landfills still exist, and they let a valuable fuel source escape into the atmosphere. The more modern systems harness methane and make use of it to power homes and create liquid natural gas used around the country. Modern landfills are impressive systems that rely on a bunch of different features to help them function properly. They’re leaps and bounds better than the older style dumps or the original landfills, and they offer a bunch of benefits compared to older models. Older landfills or dumps weren’t very safe. They were notoriously leaky, and even after being put together and capped they would drain out into the soil around them and contaminate the ground water as well. This isn’t an issue with modern landfills, because they’re considerably more stable and a whole lot safer to be around. One major benefit of a modern-day landfill is that it doesn’t keep the land from being usable forever. After it’s completely full of garbage, the landfill is carefully capped and covered with soil and foliage to create a natural looking mound that can be used to hold a park, a worksite or even farmland in some instances. Running a landfill is a full time job, especially when it’s being filled up. For that reason, most landfills generate dozens of jobs for local residents. Once a landfill is filled up and capped, there are still several workers that stay on to monitor the site, to handle gas collection, leachate decontamination and cap maintenance tasks. There’s a lot of work to be done at landfills, and each location provides people with jobs for up to 30 years after. Modern landfills are the culmination of careful development and a bunch of features that were all put together to effectively lock away our garbage so that it can’t harm the environment. In order to do this job properly, a modern landfill has to direct storm water, it must gather methane and lock away all the moisture that accumulates at the bottom. Fortunately there are features that accomplishes each of these things in a modern-day landfill. Storm water from rain showers will erode away the top of a landfill if given enough time. A modern landfill comes with a series of drainage ditches and flat sections that limit erosion and help direct the water away from the landfill entirely. Garbage produces methane as it breaks down, and that methane is a beneficial fuel source when used properly. To limit the amount of methane that’s released into the atmosphere, modern landfills come equipped with methane collection systems that trap the gas as it rises up to the top of the system. Every modern landfill comes with a thick lower liner that’s designed to contain any harmful liquid that accrues at the bottom. It’s designed to prevent chemicals from leaching into the soil and the surrounding ground water. How is waste contained in a Modern Landfill? Modern landfills rely on an advanced series of liners and clay in order to contain all the waste that’s dropped down in. At the very bottom of the landfill is a cloth layer known as an underdrain, that’s designed to capture any particles while allowing liquid to pass through. On top of that layer is a thick layer of clay that’s compacted down to prevent moisture from seeping through. To back up the clay further, the company places down a thick, 60 to 100 mil HDPE plastic membrane that’s puncture, tear and impact resistant. This layer is the backbone of the landfill liner and will keep any liquid that forms firmly in place. Leachate is a dangerous liquid that forms in all landfills. As all that trash sits in one place, water slowly seeps down over top of it and through it, creating leachate. Much like deadly flood water, leachate collects dangerous chemicals, poisons and harmful compounds contained within all the trash throughout the landfill. 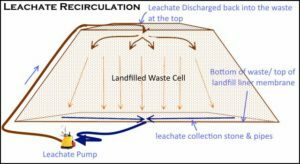 Imagine chemicals from plastics, paints, batteries, rotten food and all the other harmful compounds in landfills all coming together into one mixture, and that’s exactly what leachate is. 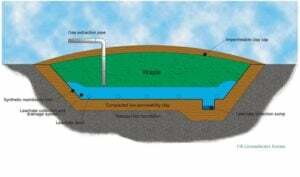 How does a modern landfill deal with leachate? Leachate is one of the deadliest parts of a modern-day landfill, because this harmful liquid can seep out into the ground water and other surrounding areas if it isn’t managed properly. Fortunately a great deal of effort is put into containing leachate, and taking care of it before it can cause problems. A thick landfill liner is added to trap leachate within the landfill itself so it can’t seep out and cause trouble, but there is also a collection system designed to physically remove it so that it can be treated and done away with entirely. Landfills are sloped so that leachate will run in a specific path, and across that path there is a series of gravel mounds, sand pits and perforated pipes designed to only allow leachate through, while trapping all the solid particles along the way. As leachate forms it runs through this massive filtration system, and finally collects in a pool down at the bottom where a sump pump is located. The pump drives the leachate liquid up through a series of pipes, directing it to a waste-water treatment facility, or holding tanks to stay until it’s eventually transported to a waste-water facility. The facility will process the leachate and separate all the harmful chemicals from the actual water itself. How do modern landfills deal with storm water? Storm water is a serious issue for landfills, because if it isn’t managed it will eventually erode way the top layer of soil that keeps all that garbage contained. A few techniques are employed to help minimize erosion after a landfill is capped. The first is known as a diversion berm or terrace. This is a section of the landfill that’s flattened out and is really helpful in minimizing erosion. Instead of being one large pile of soil, landfill caps are mounds of soil broken up by flat terraces made of stone and other durable materials. These flat spots stop serious erosion from occurring over time, and make landfill caps easy to maintain. They have to be carefully constructed so that they aren’t creating vertical drops that are too large, but have to be large enough to really break up the downward slope of a landfill. On top of all the berms and terraces used on a landfill cap, modern-day landfills are covered with vegetation as well. This layer of vegetation helps prevent erosion, while also making the area usable for recreation, living or farming purposes. It’s difficult to distinguish most landfill locations over time, and you may live close to a site without even realizing it. Modern landfills are a large source of fuel in the United States, and power millions of homes each and every year. These massive garbage pits put off a whole lot of methane gas, which could be harmful to the environment, but not when it’s converted to fuel. The extracted methane is burned on site typically to generate electricity. It’s also stored away in tanks and sold as a fuel source in some instances.When methane is burnt it creates an incredibly hot flame, that can be used to heat buildings or generate electricity. It’s a highly beneficial byproduct of modern landfills, and is a way to lower the costs of these systems. Methane can also be converted into liquid natural gas and used as a power source later on. This is the approach that some modern landfills take when capturing all the gas produced. Landfills are located all over the United States, with several popping up in most of the states, but some are larger than others. It’s truly impressive how massive some of the biggest landfills are in the country, and some of them continue to grow each and every day. The Fresh Kills landfill was closed back in 2001 with about 150 million tons of waste overall, most of which came from New York City. This massive landfill holds the remains of the World Trade Center. Nevada’s Sin City generates massive amounts of trash that’s all diverted to the Apex Regional Landfill in Nevada. This massive construction holds about 50 million tons of waste currently and is expected to hold up to one billion tons when it’s finally closed. Puente Hills is the largest landfill serving Los Angeles, and it currently holds about 3.7 million tons of garbage. This massive construction covers a total of 700 acres and is nearly 500 feet high overall. It will hold a massive amount of garbage before it’s closed and it generates enough electricity annually to power approximately 50,000 homes. The Altamont landfill in Alameda California is one of the most technologically advanced with an extensive set of gas pipes that capture 93% of all the gas produced in the landfill. The captured methane is used to product 10,000 gallons of liquid natural gas each and every day, and what remains is burned to product power for up to 8,000 homes. While it would be ideal to recycle all of our garbage and prevent the need for landfills at all, that’s not going to happen in the United States anytime soon. At least we have these massive marvels to help keep our waste safely contained away, and many people are even benefitting from the power created by modern landfills.